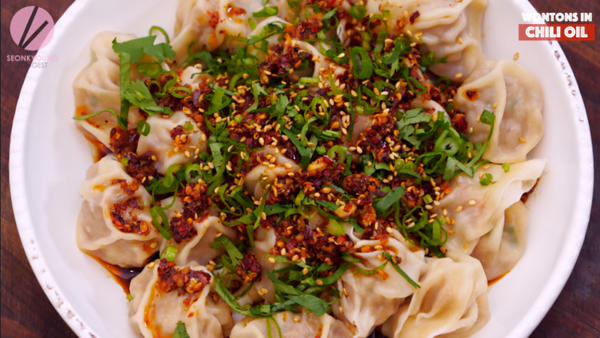 Wontons in Chili Oil, Sichuan style!! 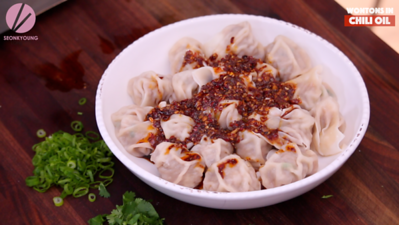 As you had as an appetizer in Din Tai Fung or your favorite Chinese restaurant… actually, this recipe is be better! Perfect for holiday parties to wow your guests! 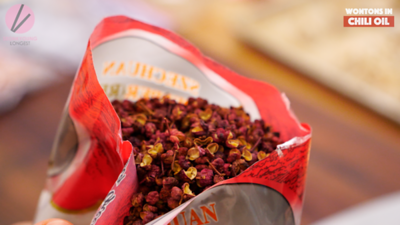 First, lightly toast Sichuan peppercorns in a dry pan over medium heat for 2 minutes or until you can smell the aroma. 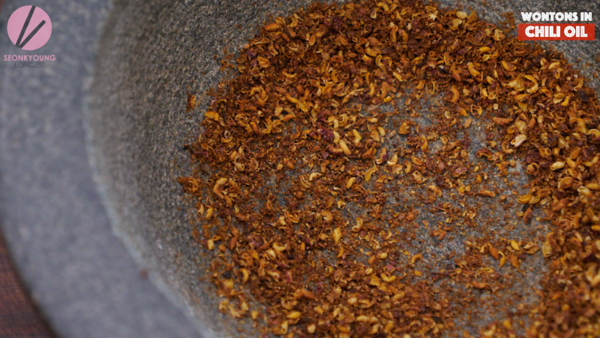 Transfer to a mortar and grind with pestle as same texture as chili flakes, set aside. 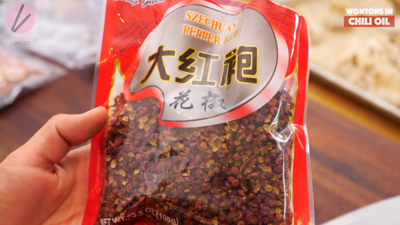 Sichuan peppercorn has very different flavor than regular other peppercorns. It gives a numbing feeling on your tongue. Yes, I said numbing feeling! It’s a signature flavor of Sichuan cuisine. It is either you love it or hate it kind of taste, so give it a try and see! 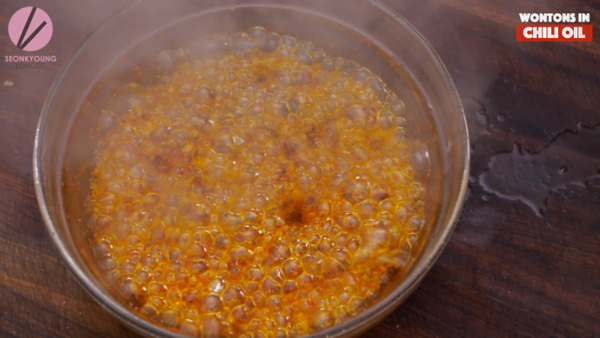 Heat oil in a small sauce pan over medium low heat. I used avocado oil but you can also use vegetable, canola or peanut oil for this recipe! Meanwhile, combine garlic, ginger, white part of green onion, Thai chili flakes, sugar, salt and Sichuan pepercorns in a heat proof bowl. Make sure to use HEAT PROOF BOWL for this recipe!! 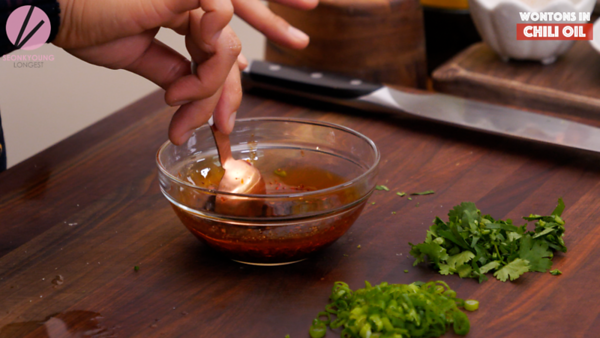 Carefully pour hot oil over the ingredients. Aware that the oil will boil immediately. Stir and set a side. 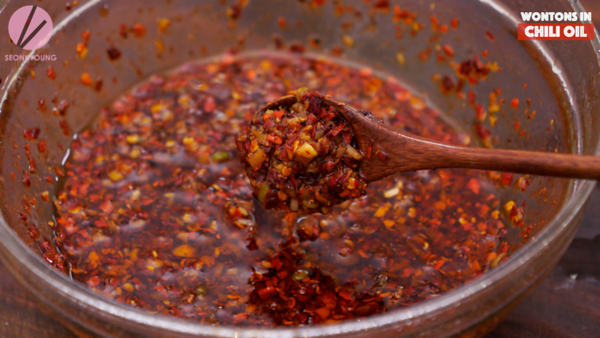 You can keep this chili oil for 30 days on a pantry. Boil a pot of water to cook wontons. You can use store bought frozen or homemade fresh ones… it all works for this recipe! 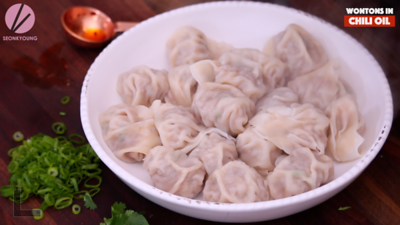 I used my recent wonton recipe, if you want to check out click down below! Cook the wontons until fully cooked, about 5 minutes. Meanwhile, combine chili oil, black vinegar, soy sauce and sugar in a small mixing bowl. 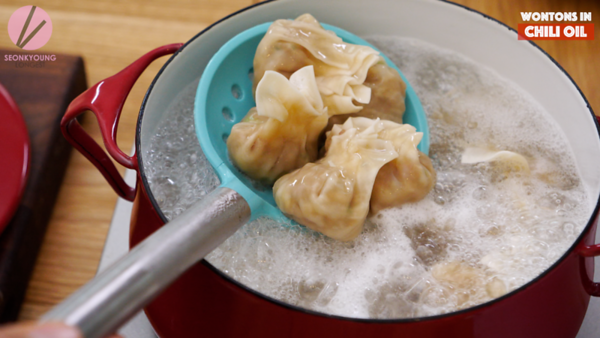 Remove cooked wontons from the boiling water with a strain spatular and place on a serving plate. When the wontons are still popping hot, pour the chili oil mixture right on top. Garnish with green part of green onion, cilantro and sesame seeds. 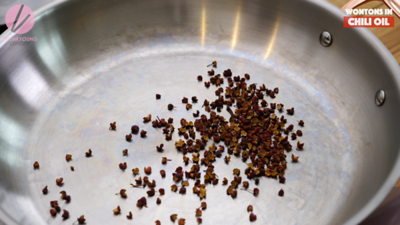 Lightly toast Sichuan peppercorns in a dry pan over medium heat for 2 minutes or until you can smell the aroma. 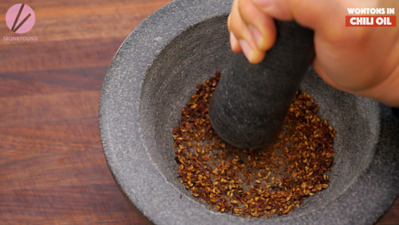 Transfer to a mortar and grind with pestle as same texture as chili flakes, set aside. 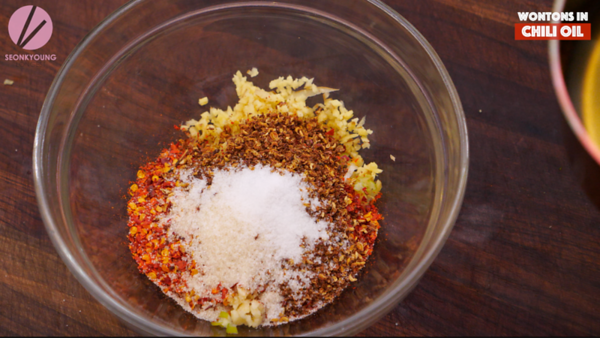 Meanwhile, combine garlic, ginger, white part of green onion, chili flakes, sugar, salt and Sichuan pepercorns in a heat proof bowl. 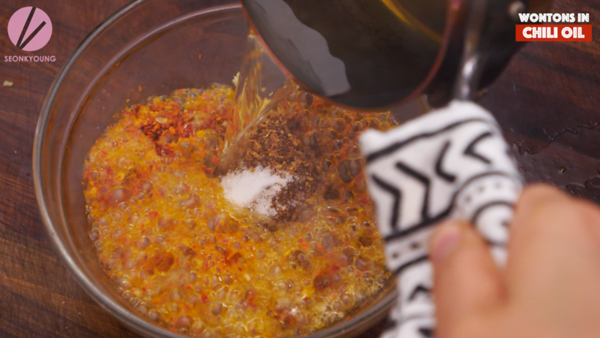 Carefully pour hot oil over the ingredients. Aware that the oil will boil immediately. Stir and set a side. 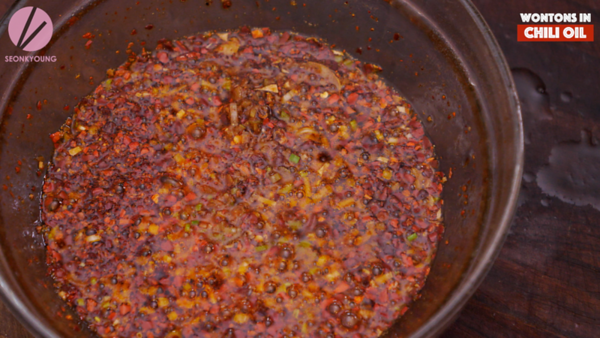 You can keep this chili oil for 30 days on a pantry. Boil a pot of water to cook wontons. You can use store bought frozen or homemade fresh ones… it all works for this recipe! Cook the wontons until fully cooked, about 5 minutes. 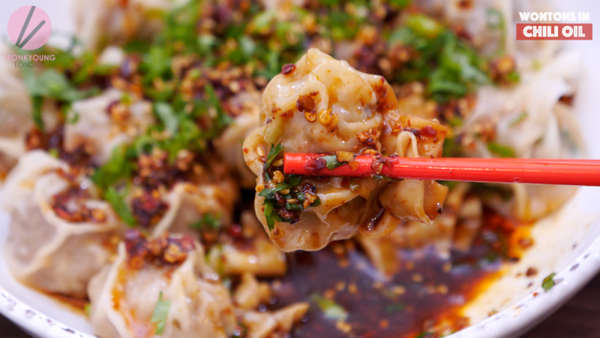 Remove cooked wontons from the boiling water with a strain spatular and place on a serving plate. When the wontons are still popping hot, pour the chili oil mixture right on top. Garnish with green part of green onion, cilantro and sesame seeds. Serve immediately. Enjoy! I think I replied to your YT comment Ro, if it looks like the pic I shared in this post, then it is! Thank you so much for this recipe. Today is my birthday and this is EXACTLY what I needed to make it a good one. Hi Seonkyoung! 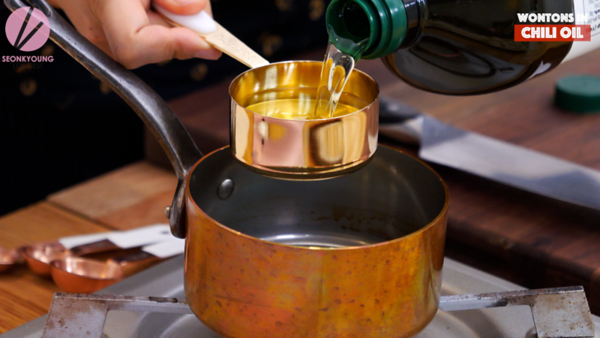 Can I use olive oil instead of the oils you cited? What brand of heat proof bowl is yours? I’ve looked everywhere and most stores describes their bowls as “glass is microwave, oven, freezer and dishwasher safe.” This brand is specifically the Anchor brand from Walmart. Hello, i don’t have an Asian market in my town and I want to pur have Thai chili flakes online. What is the brand would you recommend? I like super hot flakes so the Thai ones are perfect. Love this recipe and also your quick ramen videos. Thank you!